This article is about the body of water between Arabia and Africa. For other uses, see Red Sea (disambiguation). On the North. The Southern limits of the Gulfs of Suez [A line running from Ràs Muhammed (27°43'N) to the South point of Shadwan Island (34°02'E) and thence Westward on a parallel (27°27'N) to the coast of Africa] and Aqaba [A line running from Ràs al Fasma Southwesterly to Requin Island (27°57′N 34°36′E﻿ / ﻿27.950°N 34.600°E﻿ / 27.950; 34.600) through Tiran Island to the Southwest point thereof and thence Westward on a parallel (27°54'N) to the coast of the Sinai Peninsula]. On the South. A line joining Husn Murad (12°40′N 43°30′E﻿ / ﻿12.667°N 43.500°E﻿ / 12.667; 43.500) and Ras Siyyan (12°29′N 43°20′E﻿ / ﻿12.483°N 43.333°E﻿ / 12.483; 43.333). 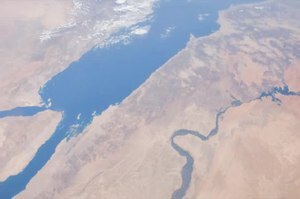 Red Sea is a direct translation of the Greek Erythra Thalassa (Ερυθρὰ Θάλασσα), Latin Mare Rubrum (alternatively Sinus Arabicus, literally "Arabian Gulf"), Arabic: البحر الأحمر‎, translit. Al-Baḥr Al-Aḥmar (alternatively بحر القلزم Baḥr Al-Qulzum, literally "the Sea of Clysma"), Somali Badda Cas and Tigrinya Qeyyiḥ bāḥrī (ቀይሕ ባሕሪ). 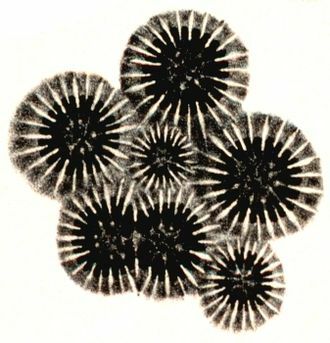 The name of the sea may signify the seasonal blooms of the red-coloured Trichodesmium erythraeum near the water's surface. 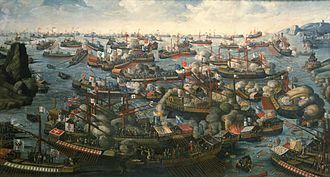 A theory favoured by some modern scholars is that the name red is referring to the direction south, just as the Black Sea's name may refer to north. The basis of this theory is that some Asiatic languages used colour words to refer to the cardinal directions. 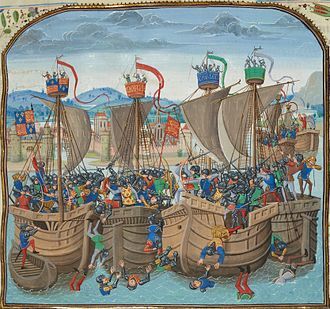 Herodotus on one occasion uses Red Sea and Southern Sea interchangeably. The name in Hebrew Yam Suph (Hebrew: ים סוף‎, lit. 'Sea of Reeds' is of biblical origin. The name in Coptic: ⲫⲓⲟⲙ `ⲛϩⲁϩ Phiom Enhah ("Sea of Hah") is connected to Egyptian root ḥḥ which refers to water and sea (for example the names of the Ogdoad gods Heh and Hauhet). The association of the Red Sea with the biblical account of the Israelites crossing the Red Sea is ancient, and was made explicit in the Septuagint translation of the Book of Exodus from Hebrew to Koine Greek in approximately the third century B.C. In that version, the Yam Suph (Hebrew: ים סוף‎, lit. 'Sea of Reeds') is translated as Erythra Thalassa (Red Sea). The Red Sea is one of four seas named in English after common color terms — the others being the Black Sea, the White Sea and the Yellow Sea. 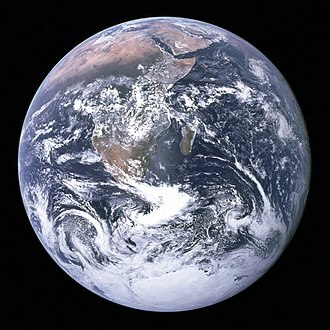 The direct rendition of the Greek Erythra thalassa in Latin as Mare Erythraeum refers to the north-western part of the Indian Ocean, and also to a region on Mars. The earliest known exploration of the Red Sea was conducted by ancient Egyptians, as they attempted to establish commercial routes to Punt. One such expedition took place around 2500 BC, and another around 1500 BC (by Hatshepsut). 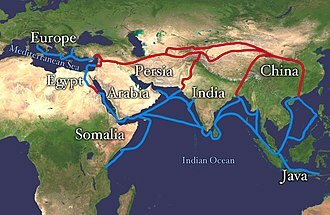 Both involved long voyages down the Red Sea. 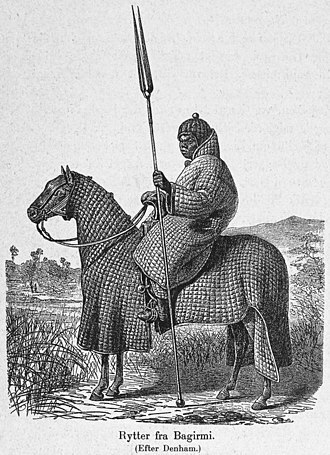 Historically, scholars argued whether these trips were possible. The biblical Book of Exodus tells the account of the Israelites' crossing of a body of water, which the Hebrew text calls Yam Suph (Hebrew: יַם סוּף). Yam Suph was traditionally identified as the Red Sea. Rabbi Saadia Gaon (882‒942), in his Judeo-Arabic translation of the Pentateuch, identifies the crossing place of the Red Sea as Baḥar al-Qulzum, meaning the Gulf of Suez. 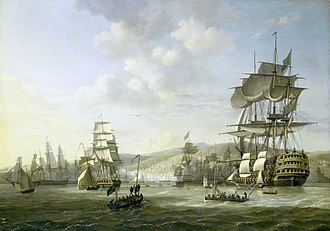 In 1798, France ordered General Napoleon to invade Egypt and take control of the Red Sea. Although he failed in his mission, the engineer Jean-Baptiste Lepère, who took part in it, revitalised the plan for a canal which had been envisaged during the reign of the Pharaohs. Several canals were built in ancient times from the Nile to the Red Sea along or near the line of the present Sweet Water Canal, but none lasted for long. 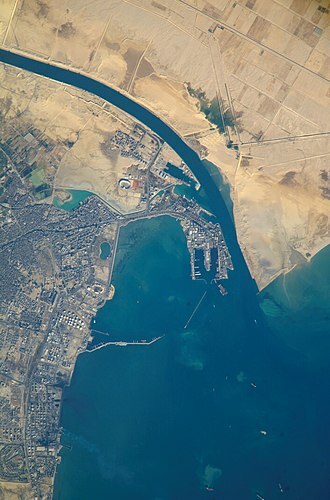 The Suez Canal was opened in November 1869. At the time, the British, French, and Italians shared the trading posts but these were gradually dismantled following the First World War. After the Second World War, the Americans and Soviets exerted their influence whilst the volume of oil tanker traffic intensified. However, the Six-Day War culminated in the closure of the Suez Canal from 1967 to 1975. Today, in spite of patrols by the major maritime fleets in the waters of the Red Sea, the Suez Canal has never recovered its supremacy over the Cape route, which is believed to be less vulnerable to piracy. 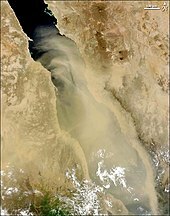 The rainfall over the Red Sea and its coasts is extremely low, averaging 0.06 m (2.36 in) per year. The rain is mostly short showers, often with thunderstorms and occasionally with dust storms. The scarcity of rainfall and no major source of fresh water to the Red Sea result in excess evaporation as high as 205 cm (81 in) per year and high salinity with minimal seasonal variation. A recent underwater expedition to the Red Sea offshore from Sudan and Eritrea found surface water temperatures 28 °C (82 °F) in winter and up to 34 °C (93 °F) in the summer, but despite that extreme heat the coral was healthy with much fish life with very little sign of coral bleaching, with only 9% infected by Thalassomonas loyana, the 'white plague' agent. Favia favus coral there harbours a virus, BA3, which kills T. loyana. 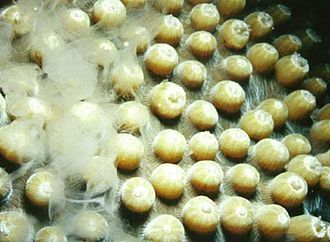 Plans are afoot to use samples of these corals' apparently heat-adapted commensal algae to salvage bleached coral elsewhere. Detailed information regarding current data is lacking, partially because the currents are weak and both spatially and temporally variable. The variation of temporal and spatial currents is as low as 0.5 m (1.6 ft) and are governed all by wind. During the summer, NW winds drive surface water south for about four months at a velocity of 15–20 cm/s (6–8 in/s), whereas in winter the flow is reversed resulting in the inflow of water from the Gulf of Aden into the Red Sea. The net value of the latter predominates, resulting in an overall drift to the north end of the Red Sea. Generally, the velocity of the tidal current is between 50–60 cm/s (20–23.6 in/s) with a maximum of 1 m/s (3.3 ft/s) at the mouth of the al-Kharrar Lagoon. However, the range of the north-northeast current along the Saudi coast is 8–29 cm/s (3–11.4 in/s). The Red Sea was formed by the Arabian peninsula being split from the Horn of Africa by movement of the Red Sea Rift. This split started in the Eocene and accelerated during the Oligocene. The sea is still widening (in 2005, following a three-week period of tectonic activity it had grown by 8m), and it is considered that it will become an ocean in time (as proposed in the model of John Tuzo Wilson). In 1949, a deep water survey reported anomalously hot brines in the central portion of the Red Sea. Later work in the 1960s confirmed the presence of hot, 60 °C (140 °F), saline brines and associated metalliferous muds. 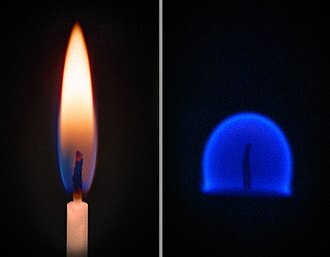 The hot solutions were emanating from an active subseafloor rift. Lake Asal in Djibouti is eligible as an experimental site to study the evolution of the deep hot brines of the Red Sea. Indeed, by observing the strontium isotope composition of the Red Sea brines, it is easy to deduce how these salt waters found at the bottom of the Red Sea could have evolved in a similar way to Lake Asal, which ideally represents their compositional extreme. The high salinity of the waters was not hospitable to living organisms. A number of volcanic islands rise from the center of the sea. Most are dormant. However, in 2007, Jabal al-Tair island in the Bab el Mandeb strait erupted violently. Two new islands were formed in 2011 and 2013 in the Zubair Archipelago, a small chain of islands owned by Yemen. The first island, Sholan Island, emerged in an eruption in December 2011, the second island, Jadid, emerged in September 2013. The Durwara 2 Field was discovered in 1963, while the Suakin 1 Field and the Bashayer 1A Field were discovered in 1976, on the Egyptian side of the Red Sea. The Barqan Field was discovered in 1969, and the Midyan Field in 1992, both within the Midyan Basin on the Saudi Arabian side of the Red Sea. The 20 m thick Middle Miocene Maqna Formation is an oil source rock in the basin. 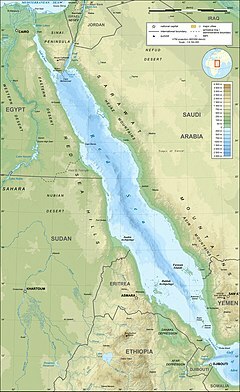 Oil seeps occur near the Farasan Islands, the Dahlak Archipelago, along the coast of Eritrea, and in the southeastern Red Sea along the coasts of Saudi Arabia and Yemen. It contains 175 species of nudibranch, many of which are only found in the Red Sea. There are at least 18 desalination plants along the Red Sea coast of Saudi Arabia which discharge warm brine and treatment chemicals (chlorine and anti-scalants) that bleach and kill corals and cause diseases in the fish. This is only localized, but it may intensify with time and profoundly impact the fishing industry. The sea is known for its recreational diving sites, such as Ras Mohammed, SS Thistlegorm (shipwreck), Elphinstone Reef, The Brothers, Daedalus Reef, St.John's Reef, Rocky Island in Egypt and less known sites in Sudan such as Sanganeb, Abington, Angarosh and Shaab Rumi. The Red Sea became a popular destination for diving after the expeditions of Hans Hass in the 1950s, and later by Jacques-Yves Cousteau. Popular tourist resorts include El Gouna, Hurghada, Safaga, Marsa Alam, on the west shore of the Red Sea, and Sharm-el-Sheikh, Dahab, and Taba on the Egyptian side of Sinaï, as well as Aqaba in Jordan and Eilat in Israel in an area known as the Red Sea Riviera. Tourism to the region has been threatened by occasional terrorist attacks, and by incidents related to food safety standards. In addition to the standard geographical definition of the six countries bordering the Red Sea cited above, areas such as Somalia are sometimes also described as Red Sea territories. 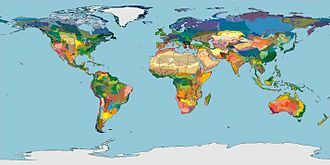 This is primarily due to their proximity to and geological similarities with the nations facing the Red Sea and/or political ties with said areas. ^ "The Red Sea". Retrieved 6 January 2009. ^ "Red Sea" (PDF). Archived from the original (PDF) on 25 February 2009. Retrieved 6 January 2009. ^ "Red Sea". Encyclopædia Britannica Online Library Edition. Encyclopædia Britannica. Retrieved 2008-01-14. ^ "How the Red Sea Got its Name". ^ Vycichl, Werner (1983). 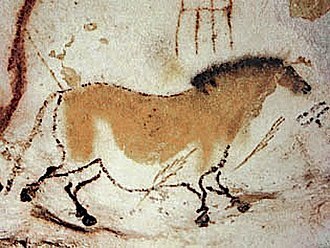 Dictionnaire Etymologique de La Langue Copte. Leuven: Peeters. 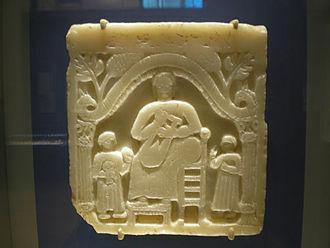 p. 320. ^ "Arabia". World Digital Library. Retrieved 11 August 2013. ^ Fernandez-Armesto, Felipe (2006). Pathfinders: A Global History of Exploration. W.W. Norton & Company. 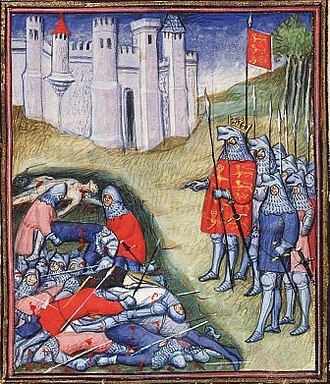 p. 24. ISBN 0-393-06259-7. ^ Louis, Jaucourt de chevalier (1765). Red Sea. pp. 367–368. ^ Tafsir, Saadia Gaon, s.v. Exodus 15:22, et al. ^ Fernandez-Armesto, Felipe (2006). Pathfinders: A Global History of Exploration. W.W. Norton & Company. pp. 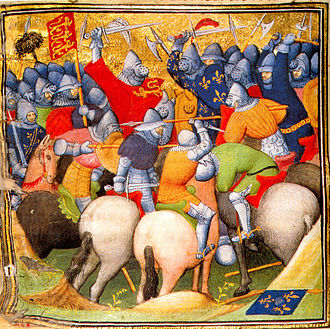 32–33. ISBN 0-393-06259-7. ^ East, W. Gordon (1965). The Geography behind History. W.W. Norton & Company. pp. 174–175. ISBN 0-393-00419-8. ^ "Egyptian Dust Plume, Red Sea". earthobservatory.nasa.gov. 8 July 2013. ^ 'Virus protects coral from 'white plague',' at New Scientist, 7 July 2012.p.17. ^ Rose, Paul; Laking, Anne (2008). Oceans: Exploring the hidden depths of the underwater world. London: BBC Books. ISBN 978-1-84-607505-6. 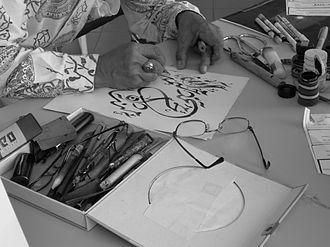 ^ a b Boschetti, Tiziano; Awaleh, Mohamed Osman; Barbieri, Maurizio (2018). "Waters from the Djiboutian Afar: a review of strontium isotopic composition and a comparison with Ethiopian waters and Red Sea brines". Water. 10. doi:10.3390/w10111700. ^ Israel, Brett (December 28, 2011). "New Island Rises in the Red Sea". 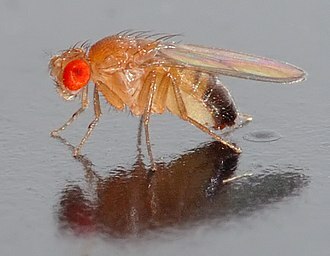 LiveScience.com. Retrieved 2015-07-31. ^ Oskin, Becky; SPACE.com (May 30, 2015). "Red Sea Parts for 2 New Islands". 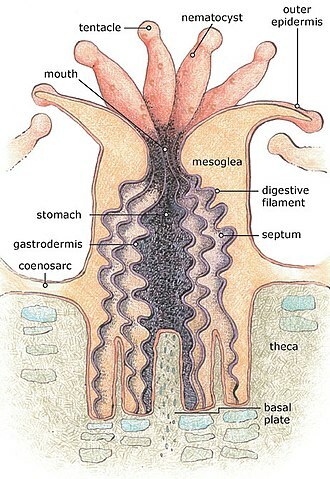 Scientific American. Retrieved 2015-07-31. ^ Lindquist, Sandra (1998). The Red Sea Province: Sudr-Nubia(!) and Maqna(!) Petroleum Systems, USGS Open File Report 99-50-A. US Dept. of the Interior. pp. 6–7, 9. ^ a b Froese, Ranier; Pauly, Daniel (2009). "FishBase". Retrieved 2009-03-12. 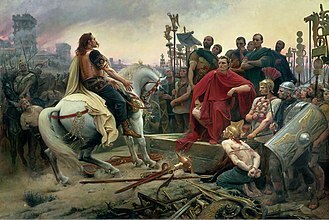 ^ Siliotti, A. (2002). Verona, Geodia, ed. Fishes of the red sea. ISBN 88-87177-42-2. ^ Yonow, Nathalie (2012). "Nature's Best-Dressed". Saudi Aramco World. Vol. 63 no. 4. Aramco Services Company. pp. 2–9. Retrieved 11 December 2018. ^ Mabrook, B. "Environmental Impact of Waste Brine Disposal of Desalination Plants, Red Sea, Egypt", Desalination, 1994, Vol.97, pp.453-465. ^ "Scuba Diving in Egypt - Red Sea - Dive The World Vacations". www.dive-the-world.com. ^ Philippe Cousteau Jnr (23 April 2010). Jacques Cousteau's underworld village in the Red Sea. BBC Earth. Retrieved 11 December 2018. ^ Walsh, Declan; Karasz, Palko (24 August 2018). "Hundreds of Tourists Evacuated From Hotel in Egypt After Britons' Sudden Death". New York Times. Retrieved 26 August 2018. ^ Regev, Dana (15 July 2017). "Egypt's tourism industry suffers a critical blow". DW. Retrieved 26 August 2018. Hamblin, W. Kenneth & Christiansen, Eric H. (1998). Earth's Dynamic Systems (8th ed.). Upper Saddle River: Prentice-Hall. ISBN 0-13-745373-6. Miran, Jonathan. (2018). "The Red Sea," in David Armitage, Alison Bashford and Sujit Sivasundaram (eds. ), Oceanic Histories (Cambridge: Cambridge University Press), pp. 156–181. Ras Mohammad is a national park in Egypt at the southern extreme of the Sinai Peninsula, overlooking the Gulf of Suez on the west and the Gulf of Aqaba to the east. 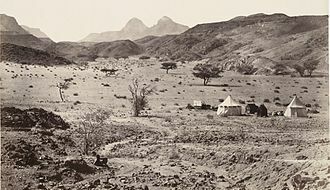 When the Sinai Peninsula was returned to Egypt, Ras Muhammad was declared for protection from fishing, some of the fishing methods, such as using dynamite and knives were impacting the coral reef and the fish populations. In 1983, the Egyptian Environmental Affairs Agency established the area as a reserve for the protection of marine. The park was established to protect against urban sprawl from Sharm El Sheikh. The name literally means Mohammads Head, where head in this instance means headland, the park is situated in the tourist region of the Red Sea Riviera, located 12 km from the city of Sharm El Sheikh. The park spans an area of 480 km², including 135 km² of surface area and 345 km² area over water. Marsa Bareika is a small bay inlet in Ras Mohammed, Ras Mohammad encompasses two islands and Sanafir. Tiran Island is located approximately 6 km offshore from the Sinai Peninsula, underwater caves formed as the result of earthquakes are located in Ras Mohammad. About 0.9 hectare of mangrove forest cover a 1.15 km shallow channel at the southernmost end of Ras Mohammad peninsula, near the mangrove and approximately 150 m inland, there are open cracks in the land, caused by earthquakes. One of the cracks is approximately 40 m length and 0. 20−1.5 m in width, within the cracks, there are pools of water, some with a depth of over 14 m. The inland area includes a diversity of habitats such as mountains and wadis and coastal mud plains. The area plays a role in migration, serving as a place of rest. Ras Mohammad National Park experiences a dry climate, with only minimal rainfall during the winter. During the summer, temperatures often exceed 40°C and low temperatures around 27°C, temperatures are mild during the winter, with daytime high temperatures averaging around 23°C and low temperatures 14°C. Coral reef, of the fringing and hermatypic types, exist along the coast around Ras Mohammad close to the shoreline, more than 220 species of coral are found in the Ras Mohammad area,125 of them soft coral. 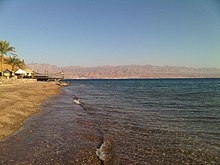 The Gulf of Aqaba or Gulf of Eilat is a large gulf at the northern tip of the Red Sea, east of the Sinai Peninsula and west of the Arabian mainland. Its coastline is divided between four countries, Israel and Saudi Arabia, the gulf is east of the Sinai Peninsula and west of the Arabian Peninsula. With the Gulf of Suez to the west, it extends from the portion of the Red Sea. It reaches a depth of 1,850 m in its central area. The gulf measures 24 kilometres at its widest point and stretches some 160 kilometres north from the Straits of Tiran to where Israel meets Egypt, like the coastal waters of the Red Sea, the gulf is one of the worlds premier sites for diving. At this northern end of the gulf are three important cities, Taba in Egypt, Eilat in Israel, and Aqaba in Jordan and they are strategically important commercial ports and popular resorts for tourists seeking to enjoy the warm climate. Further south, Haql is the largest Saudi Arabian city on the gulf, on Sinai, Sharm el-Sheikh and Dahab are the major centers. 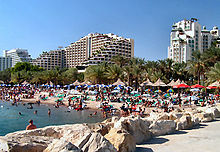 The largest population center is Aqaba, with a population of 108,000, followed by Eilat with a population of 48,000. 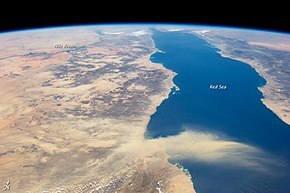 The gulf is one of two created by the Sinai Peninsulas bifurcation of the northern Red Sea, the Gulf of Suez lying to the west of the peninsula. Geologically, the forms the southern end of the Dead Sea Transform. It contains three small pull-apart basins, the Elat Deep, Aragonese Deep and Dakar Deep, formed between four left lateral strike-slip fault segments, movement on one of these faults caused the 1995 Gulf of Aqaba earthquake. 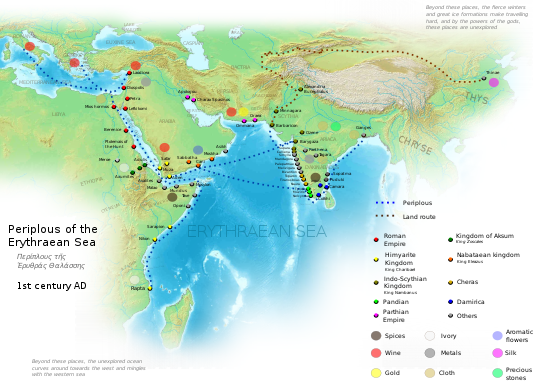 Trade across the Red Sea between Thebes port of Elim and Elat at the head of the gulf is documented as early as the Fourth Dynasty of Egypt, egyptian settlements near Timna at the head of the gulf date to the Eighteenth dynasty of Egypt. At the northern edge, the ancient city of Ayla was a hub for the Nabateans. 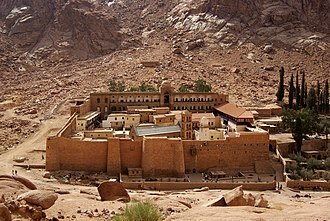 The Romans built the Via Traiana Nova, which joined the Kings Highway at Aqaba and connected Africa to Asia, Aqaba was a major Ottoman port, connected to Damascus and Medina by the Hejaz railway. The Great Rift Valley is a name given to the continuous geographic trench, approximately 6,000 kilometres in length, that runs from Lebanons Beqaa Valley in Asia to Mozambique in South Eastern Africa. The name continues in some usages, although it is considered geologically imprecise as it combines features that are today regarded as separate, although related, rift. Geologists generally refer to these incipient plates as the Nubian Plate and it included what we would call today the Lebanese section of the Dead Sea Transform, the Jordan Rift Valley, Red Sea Rift and the East African Rift. Today these rifts and faults are seen as distinct, although connected and these were only formed 35 million years ago. 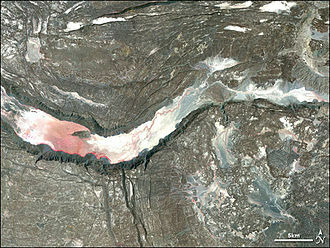 The northernmost part of the Rift corresponds to the section of what is called today the Dead Sea Transform or Rift. This midsection of the DST forms the Beqaa Valley in Lebanon, further south it is known as the Hula Valley separating the Galilee mountains and the Golan Heights. The River Jordan begins here and flows southward through Lake Hula into the Sea of Galilee in Israel, the Rift continues south through the Jordan Rift Valley into the Dead Sea on the Israeli-Jordanian border. 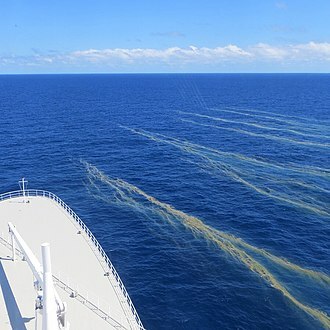 Trichodesmium erythraeum bloom, between Vanuatu and New Caledonia, SW Pacific Ocean. The Nile delta at the time of Herodotus, according to James Rennell (1800). Ras Siyyan in the Bab-el-Mandeb area.